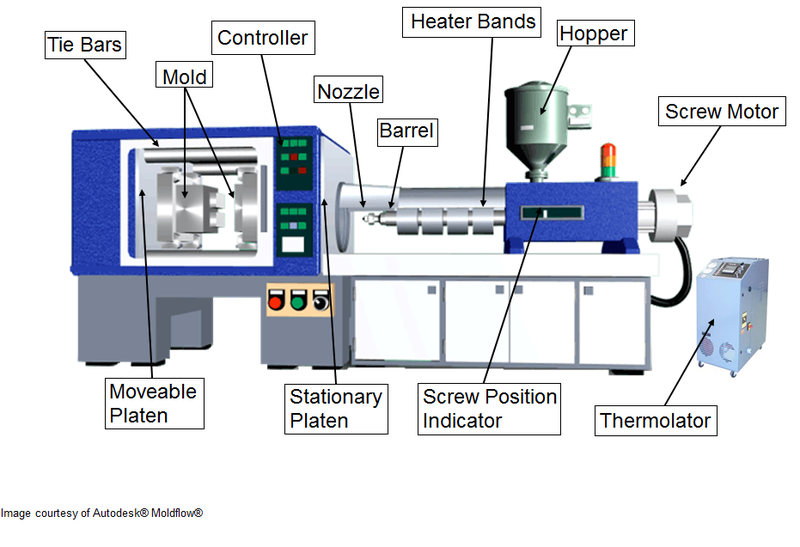 Injection Molding Machine - Beaumont Technologies, Inc.
Below are various terms related to processing and the injection molding machine. Tie Bars – Support and align the platens, which then support the mold. The space between the tie-bars limits the size of the mold that can be placed in the injection molding machine. Heater Bands – Heat the barrel and keep it at an appropriate, even temperature to prepare the melt. Screw– This is internal to the barrel and is designed to meter the material from the feed to the nozzle and to help plasticate the polymer materials. Screw Motor-Rotates the screw to plasticate and prepare the melt for injection into the mold. Moveable platen – Supports the B half (normally the ejection half) of the mold and acts to open and close the mold every molding cycle. Thermolator – Controls the supply and temperature of the coolant to the mold. Injection Time – The time it takes the screw to move from the injection start position to the transfer position (shot size). Transfer position – This is the distance on the injection molding machine controller that the screw travels in order to reach the part’s desired transfer position. This is the point where we switch from velocity control to pressure control. This is usually at the point where the part is 95-99% full. This must be set to allow for a cushion. Gate Seal – The time at which the material at the gate is frozen and no more material can be packing into the cavities. Improper gate seal can result in poor surface finish, sinks, voids, excessive shrink, and warp. Frozen Layer – During mold filling, as molten plastic comes in contact with the perimeter of any cooled channel (sprue, runner, gate and part forming cavity) a frozen layer will develop. An initial frozen skin will develop nearly instantly and its thickness will dynamically change throughout the mold filling and packing portions of the molding cycle. During mold filling, the thickness is significantly influenced by shear rate and will influence the filling pressure.